One of the greatest and most unusual churches of Victorian England, St Mary Magdalen’s was built in 1867–73 to designs by GE Street as a beacon of Anglo-Catholic faith in an area of great poverty. The Founder, Fr. Richard Temple West was a passionate advocate for improving the plight of the poor through Christian ministry in the dense, urban setting of London. 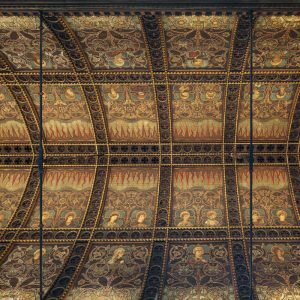 Apart from its striking architecture, the building has an almost completely intact internal decorative scheme of the highest quality: carving by Earp, glass by Holiday and Heaton, Butler & Bayne, and, above all, a magnificent ceiling decoration by Daniel Bell. This fine church includes a later addition of an undercroft Chapel of St Sepulchre by Sir Ninian Comper We are fortunate that this outstandingly beautiful and important church has been retrieved from a very sorry state. The building was rescued from imminent decay and reopened late last year after a major, award-winning restoration. An extension by architects Dow Jones has helped to make the church a focus for its community. Geoff Brandwood will give a short illustrated presentation about GE Street, Fr Henry Everett will lead a tour of this great building, and the Ven. Dr. William Jacob, who has been engaged since its inception, will discuss how the project has been achieved & the ideas which lie behind it. Meet at 6.30 PM at the church, Rowington Close, London W2 5TF. Tube: Royal Oak (5 mins walk). Cost £10 per person.